Some people have recently taken the traditional man shed to a whole new level; women have also taken to the idea of a private area outside their house and the shed might now be anything from a traditional small wooden hut to a smart contemporary stylish room with sliding doors and overnight facilities. Lots of people have looked into extending their present home with conservatories, outside sheds and structures rather than spending a lot more time effort and money on a house move. 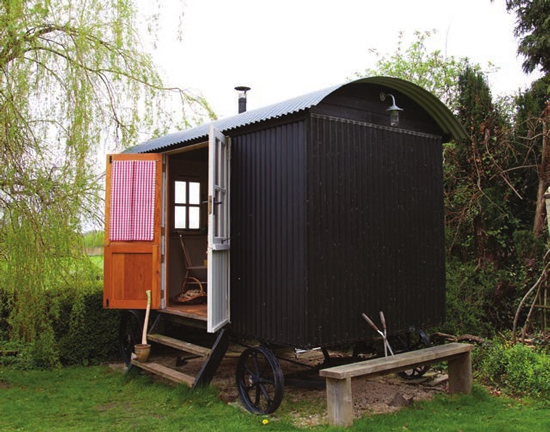 The shepherds hut is probably one of the most romantic notions for a small spare bedroom for visitors or you might prefer to keep it as a personal space for work, rest and play, an area dedicated to your hobby or special parties and meetings with friends. A wood burner will extend the season and give you more use of the area. A small stove like the Arada Acorn view 4 or 5 or the Westfire One will fit snugly in the hut. Please be aware that wooden floors and walls must be kept at a safe distance from the stove; the manufacturers will often give instructions on how far away to place. The flue similarly needs to be kept at a safe distance to avoid spreading too much heat to the fabric of the building. A single skin flue needs to have an area 3 times the diameter of the pipe to combustible material, whereas some double skin flue like Selkirk can be kept at 50mm gap from outer skin to combustible material. We can help you to work out flue design here. You might put the stove in yourself following safe instructions or use a competent fitter in your area. We can always recommend one.